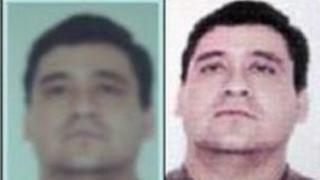 Police in Colombia say an alleged drugs lord on the country's most wanted list has turned himself in. Javier Antonio Calle Serna, better known as Comba, handed himself in to agents of the US Drug Enforcement Administration on the island of Aruba. Comba is accused of the murder in 2008 of Wilber Varela, a Colombian drugs baron whose drug-smuggling routes he supposedly took over. Comba, 43, has been taken to New York where he will stand trial. Colombian Deputy Police Chief Gen Jose Roberto Leon said Comba had been in negotiations with the US authorities for months. He said Comba handed himself in to US Drug Enforcement Administration agents on Friday in Aruba, after the "pressure on him from the security forces got too much". Gen Leon said Comba, short for Combatiente (Fighter), had started his criminal career in the 1980s, when he joined the left-wing Farc rebel movement. According to Gen Leon, Comba met drug dealer Wilber Varela in the 1990s and soon joined him as his right man hand in the Norte del Valle drugs cartel. Their alliance is believed to have lasted for more than a decade. But according to police information, during a cartel-internal feud, Comba aligned himself with Wilber Varela's arch enemy, a man known as Daniel "The Madman" Barrera. Police say their differences escalated and Comba killed his erstwhile boss and mentor in 2008. Comba is accused of having taken over the drug smuggling routes run by Wilber Varela and creating his own criminal gang, the Rastrojos. The Rastrojos are believed to run much of the drug trafficking in the western Valle del Cauca province, as well as being involved in extortion and kidnapping. US authorities say the Rastrojos have smuggled more than 30 tonnes of cocaine from Colombia to Mexico since 2008, using everything from speedboats, to fishing vessels, to semi-submersibles. Comba is expected to face charges of drug trafficking in New York, where he was taken after he turned himself in.